You don’t need to go far to get away and recharge—certainly not if you live in Bayfield, Wisconsin. Instead of exhausting your budgetto sneak in a holiday this year, why not deviate from your daily routine and be a tourist in your hometown? We’ve rounded up the best things to do and the places to stay in Bayfield for a memorable and rewarding staycation. Develop a new appreciation for Downtown Bayfield by visiting its array of quaint shops, pubs, artisan galleries, bookstores, and other historical sites. Catch the annual fall harvest festival and chat with local farmers or visit the lush parks surrounding the area. If you seek a more countrified experience, drive to local farms on the Orchard loop and tour the sprawling berry farms and apple orchards sprinkled in the valley. The Blue Vista Farm, for example, lets you pick your own sustainably grown fruits and flowers, watch apple cider being pressed, or stroll through lush meadows. While you’re there, check out an array of local artisan products inside an iconic old red barn. Bayfield Maritime Museum – Bayfield’s location along Lake Superior makes for some rich maritime history and there’s no better place to trace the city’s nautical roots than this iconic lakeside museum. Take a tour and uncover the city’s past and deep connection with the lake while participating in hands-on activities and viewing shipwrecks. 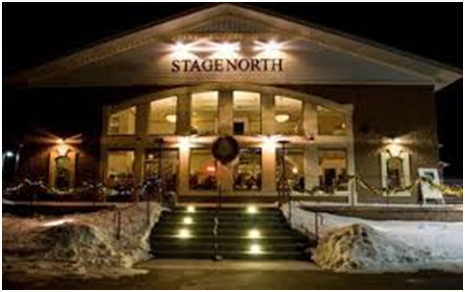 StageNorth Theatre – just a few minute’s drive from downtown Bayfield is StageNorth Theatre, Washburn’s esteemed community theater, where you can soak in the city’s performance arts and culture all while supporting theater groups. The new, state-of-the-art building also offers impressive views of the lake. Leisure boating – for as low as $100 a night, you can rent a yacht or houseboat and take itout for a relaxing cruise in one of Bayfield’s 371 lakes. Or you can take the famous 55-mile boat tour of the Apostle Islands and marvel at extraordinary rock formations, enchanting sea caves, and endless coastal scenery. Fishing – with all that water comes great fishing. Lakes like Superior, Owen, and Namekagon offer world-class inland lake fishing, where there is an abundance of opportunities to catch trout, salmon, bass, and steelhead. Throughout Bayfield County, you’ll find abundant Class 1 Trout Streams, such as Pikes Creek and Little Sioux. Off-shore fishing and or fishing from the dock in spawning streams is also worth a try. Just make sure you have a license, and research the best dates and method restrictions enforced by the state and the National Park Service. Hiking – take a break from the maritime climate and head to the rugged landscapes of Meyers Beach sea cave trail. The park offers 9 miles of wooded hiking trails and breathtaking views of thundering waterfalls. Sprinkled across the park are campgrounds and resorts where you can have a unique backwoods dining and lodging experience with the family. Despite Bayfield being a small, modest town, you won’t run out of things to do every season. With enough research and the insatiable curiosity of a tourist, you’ll discover plenty of opportunities to unwind on your own or create new memories with the family. At Windseeker Realty LLC, we’re in touch with the community and are outdoor enthusiasts ourselves. We strive to be a trusted local resource for people who want to make the most of living in Bayfield. Visit our blog for local insights and upcoming events.